A luxuriously rich velvet stout. 10 different malts went into this, giving a very complex descendant stout. It’s overflowing with chocolate, biscuit, caramel, coffee and more. At 8.6% it gives a warming sensation that is perfect for winter nights. Or just any night, no matter what the season! 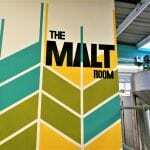 Malt: Marris Otter, Biscuit Malt, Brown Malt, Chocolate Malt, Roasted Barley, Medium Crystal Malt, Carafa 2, Special B, Cara Amber, Light Crystal Malt.